Marshfield Youth Football (MYF) is committed to advancing player safety and to protect the health and well-being of every player. We want our players to have the best experience possible while learning the fundamentals of the game in a safe environment. We are always reviewing ways to improve player safety and remain committed to adopting the best evidence-based practices. All Marshfield Youth Football coaches are required to complete the USA Football Level 1 Tackle Certification. Working with leading football experts and medical professionals, USA Football developed the Heads Up Football program to specifically meet the needs of player safety. Marshfield Youth Football has partnered with USA Football to help further educate our coaches, players, and parents on comprehensive solutions for a better and safer game. 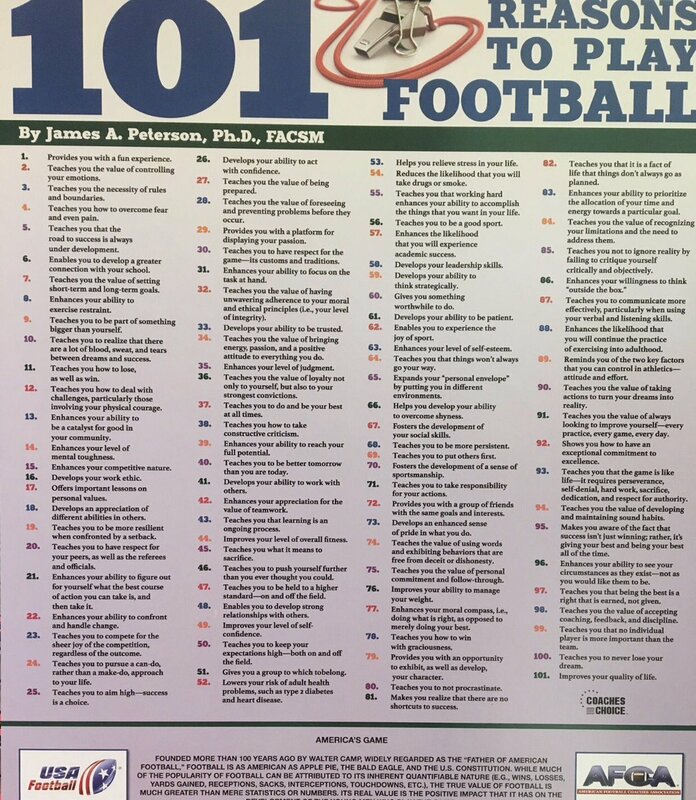 Heads Up Football educates coaches on six key elements to enhance player safety: 1) Concussion Recognition and Response 2) Heat Preparedness & Hydration 3) Sudden Cardiac Arrest 4) Equipment Fitting 5) Shoulder Tackling 6) Blocking. Shoulder tackling is a step-by-step protocol to teach the core principles of the skill and sets a new standard in player safety. The program utilizes five fundamentals through a series of drills to reinforce proper tackling mechanics and teach players how to properly tackle with a focus on reducing helmet contacts. When executed properly, shoulder tackling literally takes the head out of the game. Players are taught to keep their heads up and lead with their shoulders when tackling. In 2014, MYF became the first town of the Old Colony Youth Football League (OCYFL) to become certified through USA Football Heads Up program, including their Return to Play program that monitors the return of any athlete who has suffered a concussion. Since implementing the Heads Up program, MYF can confirm concussion numbers declined over prior years. Overall, documented injuries remain low at all grade levels. You can learn more about USA Football Heads Up program at: http://usafootball.com/headsup. 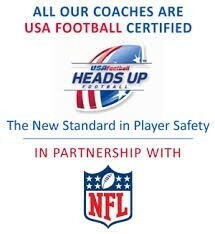 Each organization participating in USA Football Heads Up program is required to have a Player Safety Coach (PSC). Roxane Thomas is our Player Safety Commissioner and Chris Dunn is our Player Safety Coach. The PSC is responsible to oversee and implement the Heads Up Football program. A PSC attends clinics conducted by USA Football master trainers. Ensures ALL Coaches have completed the USA Football Level 1 Coach Certification Course. Conducts a Heads Up Clinic for all Coaches. Monitor the development of league players and serve as parent liaison to advance Heads Up Football and player safety. Serve as the local organization expert and point of contact for player health and safety recommendations, particularly from USA football, the NFL and the Center for Disease Control and Prevention Institute. Communicate organization concerns, questions and successes to the MYF Board and USA football. In 2014, Coach Mike Sousa received the Courtyard Marriott's Inspiring Greatness Coaches Award for his dedication, volunteerism, commitment to player safety and his role in implementing the USA Football program for MYF. https://www.youtube.com/watch?v=Ycz0n6CG5nA. All players are required to wear mouth guards that are attached to the face mask. Loose mouth guards are not allowed. A properly fitted mouth guard is a key piece of athletic gear. Mouth guards cushion impact that may otherwise cause broken teeth, jaw injuries, or cuts to the lip, tongue or face. MYF follows required OCYFL guidelines during practice days 1, 2 and 3 of the preseason. Player-to-player contact is not allowed. Practice sessions will be dedicated to conditioning and drills only. Intensity is gradually increased to help acclimate players to environmental conditions. After completion of the required non-contact period, teams have the option to wear full pads and begin full contact drills. MYF employs USA Football level of contact guidelines. Contact is introduced through a progressive manner to ensure players are using proper technique before full-contact drills are allowed. Levels of contact focuses on varying intensity levels throughout practices to build player confidence and ensure their safety. Five intensity levels are used to introduce players to practice drills which position them to master the fundamentals and increase skill development. The first three levels of USA Football Levels of Contact “Air,” “Bags,” and “Control” are considered no or controlled-contact, and thus no limitations are placed on their use in practice. Full-contact drills are limited during practice as the number of exposures may increase the chance for injury to youth players. Preseason requires more practice sessions per week to allow for teaching fundamentals with sufficient repetition to prepare for the season. Once the regular season begins and games commence, the number of practices per week is decreased to three. At all times, players have access to fluids and rest periods throughout practice sessions. MYF plays against age, grade and weight based competition. The OCYFL requires an EMT, MD, or Registered Nurse present at every game. This ensures that players will be given immediate care in the case of an injury. While particular rules, equipment, and personal discipline reduce the risk, injuries can still occur. The MYF standard in player safety is WHEN IN DOUBT, SIT THEM OUT. Players with suspected concussion will be immediately removed from play or practice, parents will be notified and the player will remain out until cleared by a health care professional. Rest is critical to recovery. Cleared players may return under the progressive return to activity program. Like any sport, football has inherent risk of injury to players. Our top priority is player safety. As such, we are proud to participate in and follow the Heads Up Football program. The purpose of these guidelines is to establish consistent methods designed to limit the chance for injury.